Although five members of the public urged more deliberation, the Sarasota County Commission voted unanimously on Nov. 17 to appropriate $1,650,000 for the purchase of new voting equipment from Election Systems & Software (ES&S), so the machines can be installed and staff and poll workers trained prior to Florida’s March 15, 2016 Presidential Primary. The funds will be borrowed from the Florida Local Government Finance Commission, according to agenda material for the meeting, with amortization over seven years. 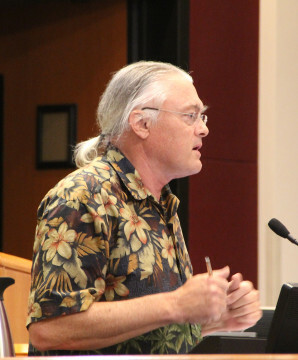 Two of the speakers who addressed the board alluded to Sarasota County’s 2006 election, when Democrat Christine Jennings lost by fewer than 400 votes to Republican Vern Buchanan in the race for the 13th Congressional District. Approximately 18,000 people who voted in other contests on the same ballot did not cast votes in the congressional race, leading to charges that the ES&S equipment in place at the time had malfunctioned. The county purchased its current Dominion system in 2007. And while Supervisor of Elections Kathy Dent said during a June 2014 budget workshop that she believed those machines would hold up through the 2016 election season, Dent explained on Nov. 17 that she no longer felt that way. 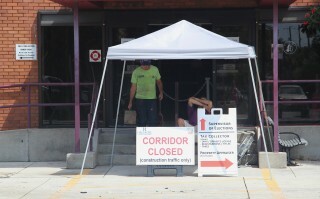 She pointed out that she began to change her mind after problems arose during routine annual maintenance this summer. 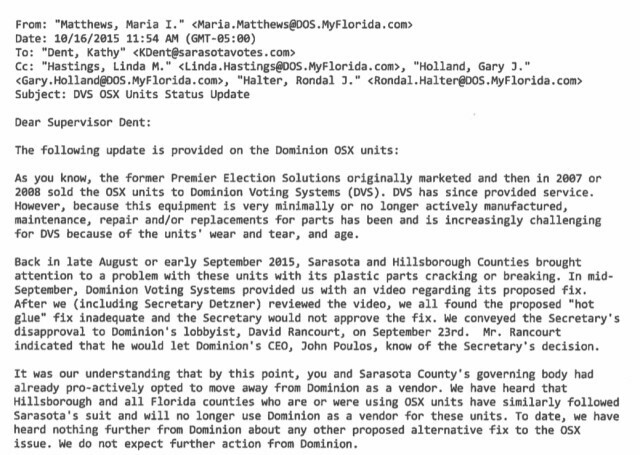 After Detzner reviewed the Sarasota situation, she noted, he could have decertified the equipment. After a brief staff presentation about the relevant items on the agenda, Robinson asked Dent to come to the podium. “Can we just go to the basics on this, start from the beginning?” Robinson asked. “I was sort of thinking you might ask me to do that,” Dent replied. After Dominion representatives encountered problems during annual maintenance, Dent explained, they would not even begin routine maintenance on the same type of system in Hillsborough County. Dominion employees asked for an opportunity to repair or replace the equipment in both counties, she continued, and the Dominion CEO even traveled to Sarasota from the company’s Toronto headquarters to meet with her. He and other company representatives “indicated they did not have replacements” for the type of equipment Sarasota County purchased in 2007, she added, because the company did not manufacture that much of it. An independent contractor for Dominion proposed the hot glue repair process, Dent noted. Nonetheless, Dominion provided her and her counterparts in Hillsborough County with a report saying the present voting tabulators “are vulnerable to damage and are more vulnerable when the internal components are accessed.” The report added that “as the units age, the rate of failure is likely to increase,” she said, though the report noted it was impossible to estimate the degree of breakdown. “As a result of that,” Dent told the commissioners, “I was concerned.” She immediately addressed the issue with County Administrator Tom Harmer, she added, and with each of the board members in one-on-one sessions. During the Venice City Council election earlier this month, she pointed out, 10 percent of the equipment broke, but she sent more machines than usual to each precinct, so the breakdowns did not impede the process. 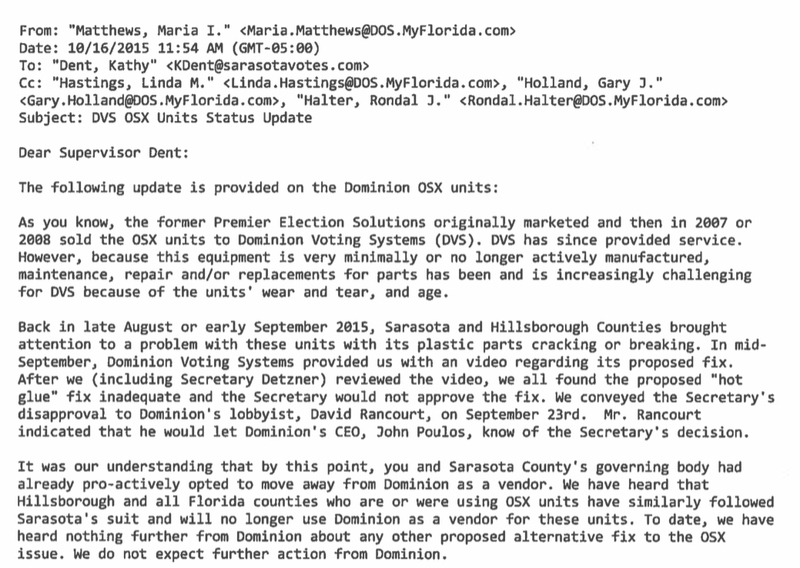 She also read the board portions of an Oct. 16 email she received from the state Division of Elections: “We do not expect further action from Dominion” in regard to handling the situation. “[That] does not give me a warm fuzzy feeling about Dominion,” she told the board. One other factor Dent explained was the county’s $1 million investment in 2007 in AutoMARK devices designed to enable blind and visually impaired persons to vote. That system will not work with the new Dominion equipment that is available, Dent continued though they can be used with the new ES&S machines. The state has certified only Dominion and ES&S as vendors of voting machines, she pointed out, so she had no choice but to seek a single bid from ES&S for the new equipment. She also noted that she has to mail ballots on Jan. 30, 2016, to military personnel and other Sarasota County voters overseas so those people can participate in the March 15, 2016 Presidential Primary. Among the five people who addressed the matter during public comments on Nov. 17, Kindra Muntz of Venice, a representative of the Sarasota Alliance for Fair Elections, said she felt the fix Dominion had proposed would be simple. She had spoken with a representative of the company, she added, and he had told her he believed voting in 2016 could proceed successfully after the repairs were made. “There’s lack of confidence in this county in ES&S,” she added. Further, she told the commissioners she could not see how a competitive bid process possibly could take 90 days. 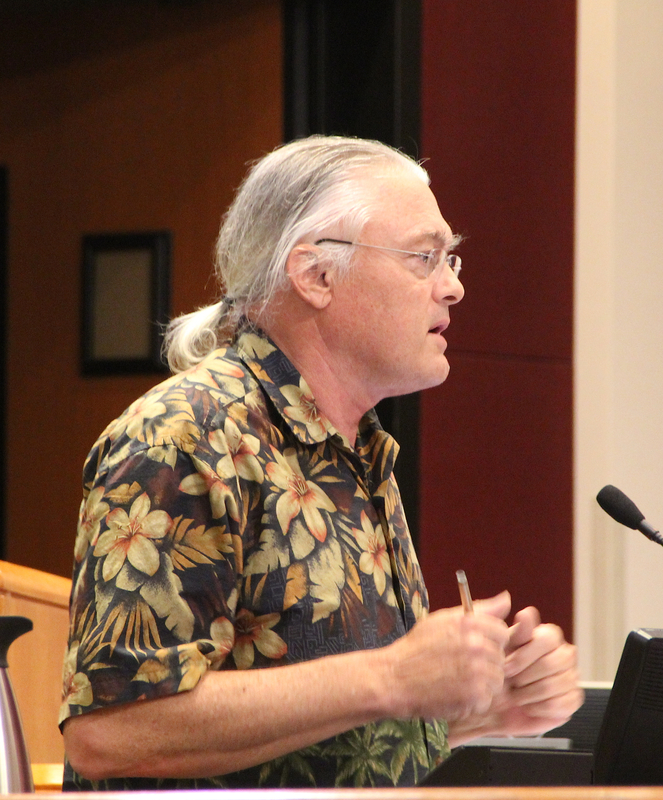 Jono Miller of Sarasota noted that while he has served on 10 county advisory boards, on only one occasion did the board ask him for such service. 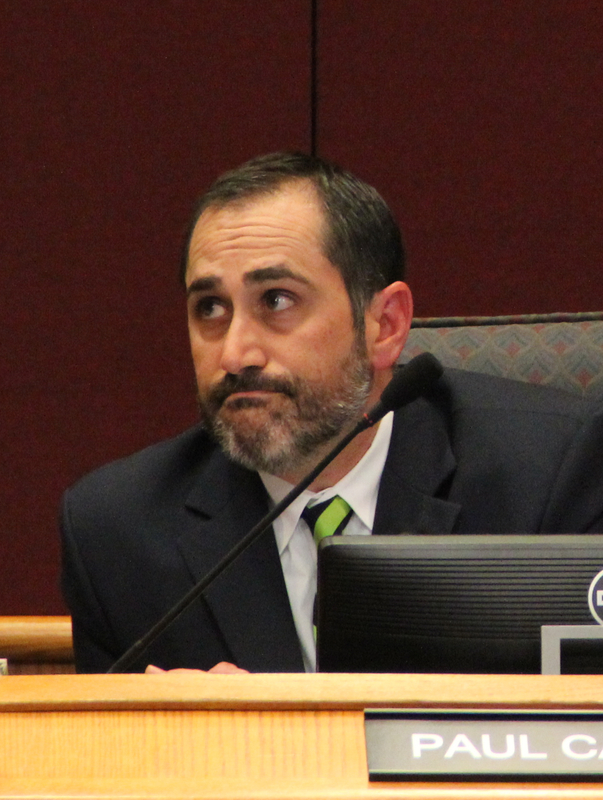 After Commissioner Caragiulo made his motion to approve the $1,650,000 appropriation for the new machines, he acknowledged that while the decision might not seem perfect from the standpoint of public perception, the board members have to take action they feel will prove best for the citizenry. 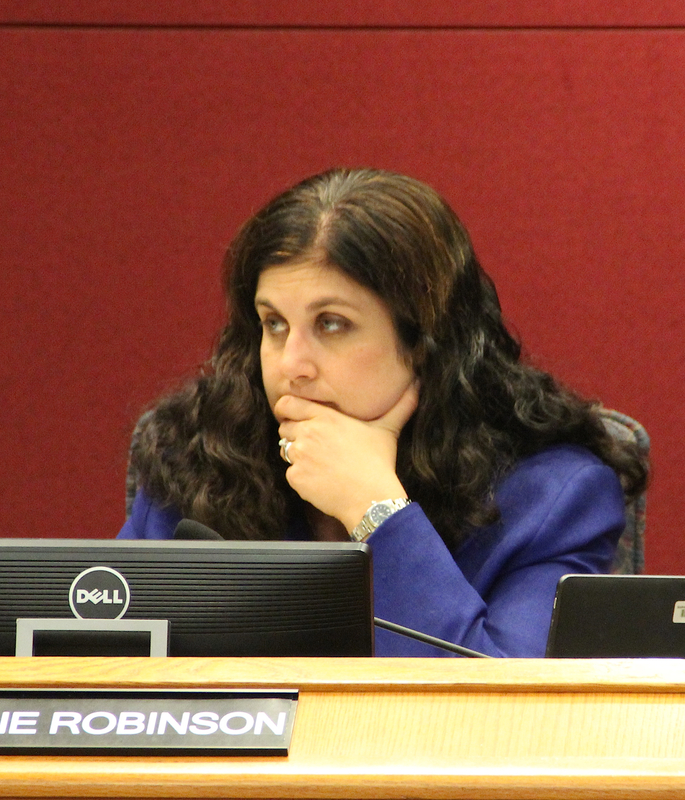 “Under the ideal situation,” Robinson added, the commissioners could take time to explore the issue further. The news that new machines would be needed for the 2016 election cycle “was a surprise to everyone,” she said. With state elections officials joining Dent in expressing concern about whether the current system would hold up through the next year, Robinson continued, she felt the County Commission needed to move forward. She also found it troubling, she noted, that Dominion had no better solution to offer than a hot glue fix. 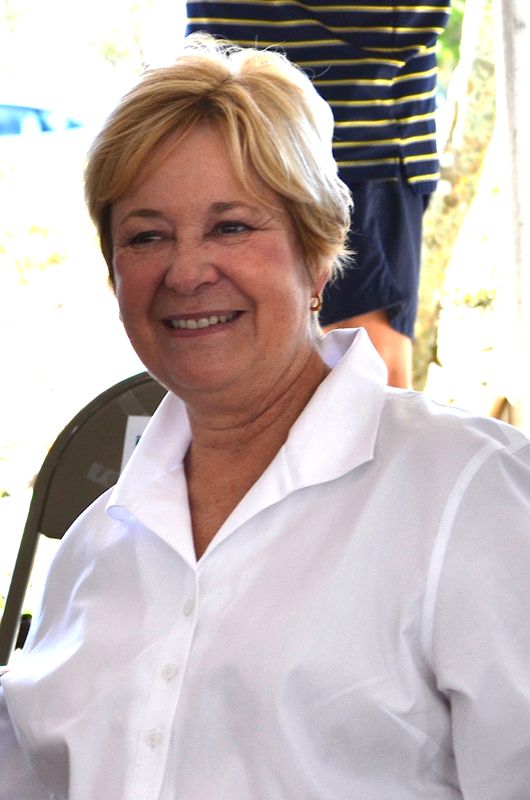 Chair Carolyn Mason was absent on Nov. 17. County spokesman Drew Winchester told The Sarasota News Leader she is recovering from a fall she suffered last week.